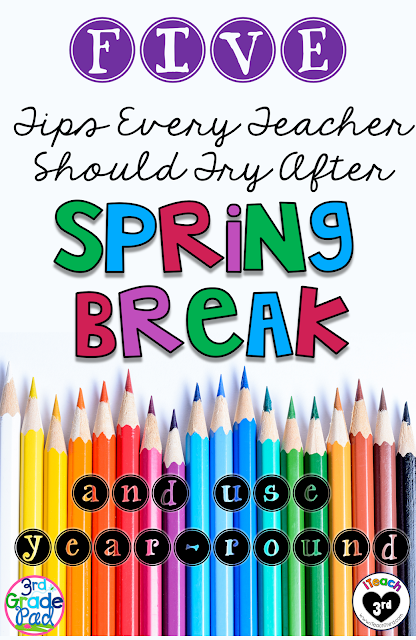 Returning from Spring Break can be the BEST time to add a spark to your classroom routines! What's more...it is also the perfect time to try out some techniques and routines that you might have been a little nervous to try! Who better to try them out with than with the students you have already established a trusting environment! These are my top tips that you should try with your students! If you aren't already using Class Dojo with your students, after Spring Break is the perfect time to start. Focus as a classroom on the behaviors you want to see most often, add them to your Positive Behavior list, and start catching your students in the act. A two-to-three month commitment late in the school year is the perfect time to try out this interactive app. Choose the Random Pick option to watch a "Secret Friend" in the hallway to add to the class total. My students always clap for the Secret Friend and thank them! Read Tara at 4th Grade Frolic's post about using Smuddles. Your Guided Math and Reading groups are probably pretty established by now. Add a little pizzazz to the routine and try out some Flexible Seating options for one of your rotations. Who knows? You may decide you want to do more in the fall when school starts!! Scoop rockers make a great option to get out of desks to do some reading or independent work in a quiet location in the room. As a 3rd grade teacher, I've never had centers in a specific "place" in the room, so this leaves the extra room available perfect for some choices on the floor. I found mine at Walmart, but I have been told you can find them at Aldi's as well! Standing Work Zone: Raise the legs of an unused table or a collection of desks in the building to create a place to plop center games and word work. Let your "standers" have a spot to work, wiggle, and lean to their heart's content during one of your rotations! When Spring Fever hits, why fight the battle when you can channel the energy productively! If GoNoodle didn't save your sanity this winter with its Inside Recess options, then you need to head over to check out the movement activities that range from the ever-calming Maximo to the goofy Koo Koo Kanga boys! Create your own list of favorites and let your kids do the choosing. Start one of these during your transition times and just WATCH you kiddoes clean up and join in no NO TIME! One my of kids' favorite activities to spend 5-10minutes is simply having the chance to get our markers, colored pencils, or crayons and draw. I have a collection of great ideas on my Pinterest Board that are Low (to zero) Prep and High Interest! You can see it HERE. These are perfect activities to follow up a round of standardized testing, too! Very stress relieving! Find a You Tube Channel will calming classical music. You might like THIS one! Guide a directed drawing, demonstrate a doodling technique, or simply give them a Squiggle that you start for them. Enjoy the last few weeks with your precious friends!